Humpback whales have visited Tonga's crystal clear blue waters for centuries. The southern humpbacks migrate from their summer feeding grounds in Antarctica to their winter breeding grounds of Tonga for it's warm tropical waters and safer birthing areas. 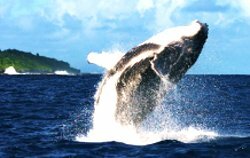 The journey takes them through the islands of Tongatapu, 'Eua island, Ha'apai and Vava'u, The whales come to mate and give birth. The Southern humpbacks start to arrive in June, and most new caves are born between July and September. The courtship displays are incredible to see with the whales leaping right out of the water. 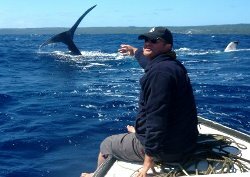 If you are going, Tonga whale watching and swimming with whales it is not un-common to have the whales jumping out, right in front or beside the whale watching boat. By October most of the new calves are big enough to travel, feeding on around 500 liters of Mum's milk a day and So the start of the long journey back, to the nutrient rich waters of Antarctica begins. By November most of the Humpback whales have left Tongan waters and are ether heading back to Antarctica or are already there. Antarctica is the favorite feeding ground of the southern humpback whales the journey is about 6000 km from Tonga. They humpback feed on Krill and schools of very small fish and as the Antarctic has acres of krill and the humpbacks eat tonnes of krill a day, you can see why this is the obvious feeding ground for them. Humpback do not have teeth they have baleen plates about 240-400 plates which hang on each side of their huge mouths. The krill and small fish get trapped between the hair fringed edges of the baleen. During the winter migration ( when they are in Tonga) the whales do not eat, they survive on fat reserves from their summer gorging in Antarctica. The whale watching and whale swimming in Tonga operators are aware of the delicate balance which needs to be maintained between viewing / harassing the whales.They have developed a code of conduct to help insure that the population of humpback whales continues to find a safe and peaceful haven in the kingdom of Tonga.